Join the discussion on our forums! 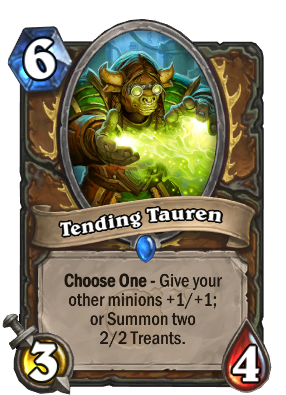 Come discuss Tending Tauren over in our dedicated Tending Tauren discussion topic. That racial bonus to Herbalism finally paid off. Love the flavor text haha. Cenarius is still in standard, you really don't need to run this. Does anybody know how's the interaction with Fandral Staghelm? Will it summon the treants first and then give them +1/+1? As far as I can remember when playing Power of the Wild it first summoned the panther and then giving all minions +1/+1 or am I wrong? 6 mana 7/8 is already over the power curve (even if it's across three bodies, since Druid has access to AOE buffs), so the fact that this can be a buff as well is ridiculously powerful. It's a bit under curve when you consider the buff side - 3 mana for the body, 1 mana for the buff, but the flexibility and treant synergy is well worth 2 mana difference on that side. This seemed to be the missing piece for what I was imagining a token/treant deck would be like. It can give you treants OR buff your board of tokens, depending on what you need. It can enable either game plan. I like it. More treant synergy and another Choose One card for Druid, nice. The stats are a little low but definitely playable. A flexible 6-mana 7/8 worth of stats spread over three bodies that can alternately buff a board for immediate damage or trading value is pretty good in a lot of decks. Too bad there isn't an effect that lets you choose both options in the current standard card pool.